The item in question: Rumors have it that this Tiffany design was once located on the Bobbs Merrill Publishers property. 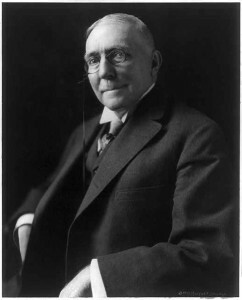 A Little Background: As most Hoosiers know, James Whitcomb Riley (1849 – 1916) was a celebrated writer, prolific poet, and best selling author. 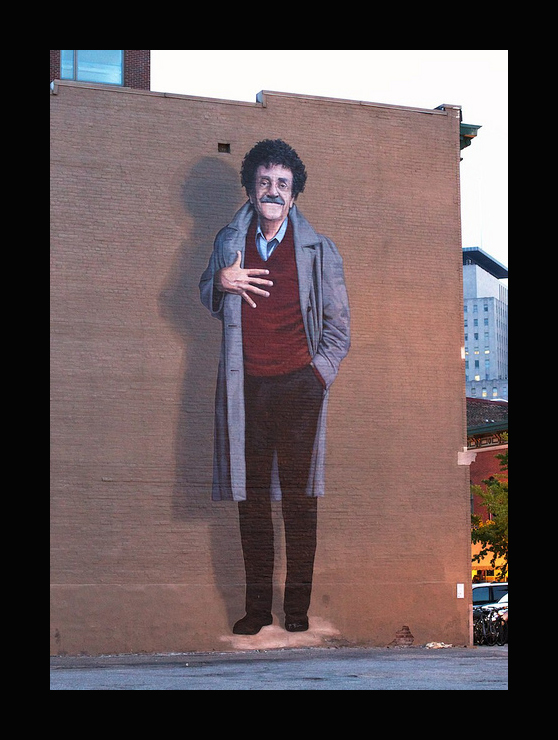 During his lifetime, he was renowned for his dialect works and his children’s poetry. One of those famous works, “Little Orphant Annie,” spawned innumerable comics, cartoons, stage plays, story spin-offs, musicals, radio shows and… eventually… movies (not to mention the associated dolls, toys and other commercial swag). 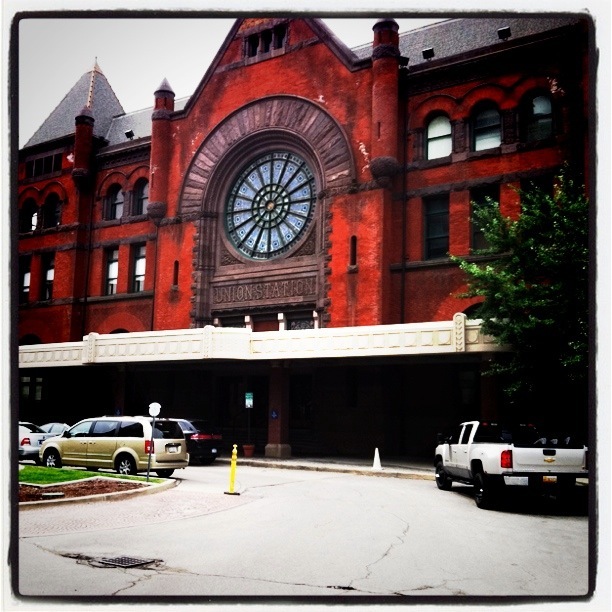 Riley is most certainly chief among our Hoosier historical treasures. 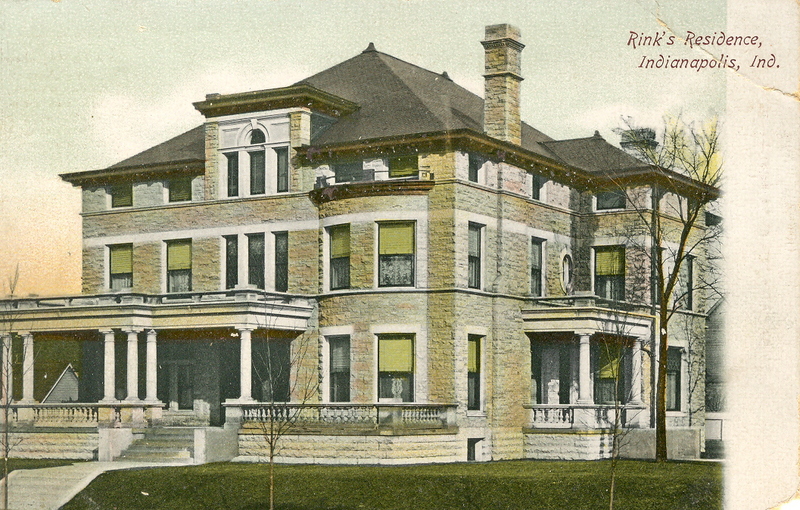 There are many memorials dedicated to Riley, including the aforementioned Boyhood Home in Greenfield, the James Whitcomb Riley House in Indianapolis where he spent the last two decades of his life, and the James Whitcomb Riley Hospital for Children, his namesake. He is buried in Crown Hill Cemetery. 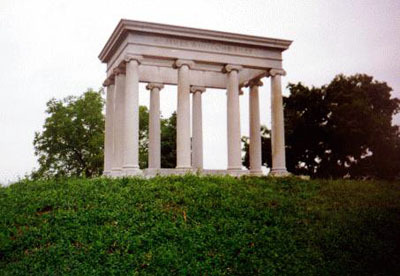 James Whitcomb Riley grave at Crown Hill Cemetery. While Little Orphan[t] Annie is perhaps Riley’s most enduring character, few people know that she was based on a real girl named Mary Alice (Smith) Gray (1850-1924), a young orphan who, at the age of eleven, worked for the Riley family in Greenfield, Indiana during the mid-19th Century. She came to help the family, “… wash the cups an’ saucers, an’ brush the crumbs away.” As part of her duties, Smith looked after the Riley children, and told tales of goblins. Though she was with the family for less than a year, the girl left a lasting impression on young James Whitcomb Riley. Smith is buried in Philadelphia, Indiana. Mary Alice (Smith) Gray, or “Allie” who became “Annie” in the JWR Orphant Annie stories, due to a typesetter’s mistake. A seemingly related piece, also by Tiffany, hangs at the Metropolitan Museum of Art. 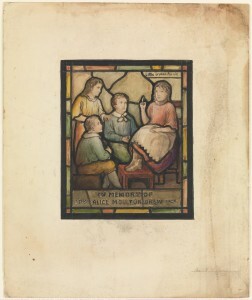 It is a design for a memorial window of Alice Moulton Drew. 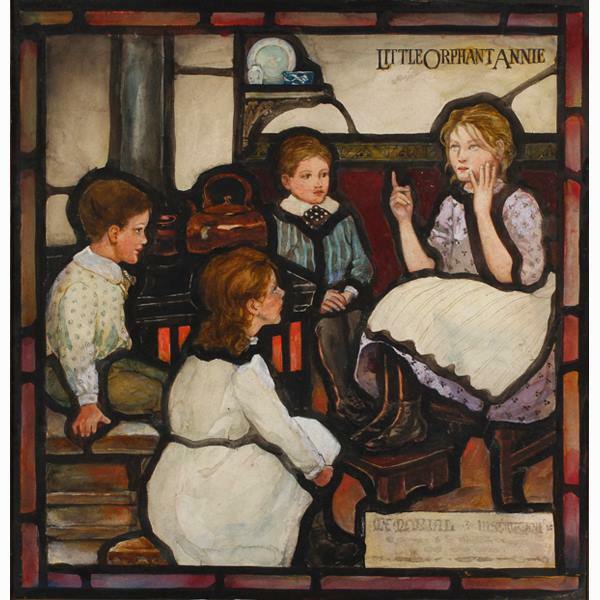 The Mystery: Here’s what we know… a stained glass window preparatory design celebrating Little Orphant Annie was offered at auction on August 11, 2012. The design was confirmed to be from Tiffany Studios’ Ecclesiastical Department, and signed by Louis Comfort Tiffany, himself. The gauche on paper design is based on Ethel Franklin Betts’ original illustration for Riley’s “Ef you don’t watch out,” published by the Indianapolis-based Bobbs Merrill company in 1908. The artwork was eventually purchased by a fellow Hoosier who is graciously loaning the piece to the JWR Boyhood Home later this year. 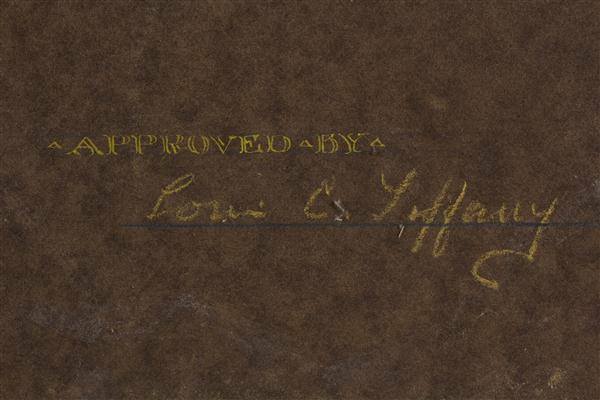 The Tiffany signature seems to indicate that the design was approved… but was it ever made into a window? 2. It is rumored, but cannot be confirmed, that the piece was commissioned by the Bobbs Merrill company and that either a window or the artwork were once located on that property. Can you help us solve the mystery? 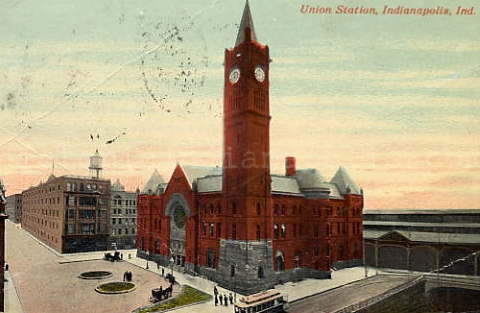 Special thanks to the members of the Marion County Indianapolis History Facebook discussion group and Brigette Cook Jones, Hostess at the James Whitcomb Riley Boyhood Home and Museum, for their help in bringing this mystery to light. Jones also hosts a Facebook page on the subject called “Orphan Annie’s Author,” which may be of interest. Check it out! Thank you so much for writing this article. 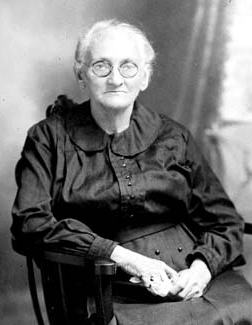 The James Whitcomb Riley Boyhood Home and Museum opens April 1st and our special exhibit this year will be on Little Orphant Annie who was Mary Alice Smith Gray. We will be featuring the Tiffany stained glass design piece as well as pulling out many of our artifacts and other things related to Mary Alice and the Orphant Annie character. We hope that everyone can make the trip out to Greenfield and have a visit. There are Tiffany archives in New York, but unfortunately this focuses on the jewelry side of the business. So no help there with this mystery. I have been in contact with the Morse Museum in Winter Park FL, which has the largest collection of Tiffany pieces. They were aware that this piece came up for auction, but cannot shed any further light on the piece. The Metropolitan Museum of Art in New York was not aware of this “sister” piece. They were very interested in it when I mentioned it. Unfortunately, their piece has very little provenace. They don’t even know who Alice Mouton Drew was. They are embarking on researching some of their Tiffany collection – but again it is a long shot. The best recommendation that I have received came from the curator at the Morse, and she said if there is a Bobbs Merrill connection – then the best place to get a clue would be to look at their archives. I believe most of Bobbs Merrill ‘ s papers are at the Lilly Library in Bloomington. However, if there is anyone who could shed further light on this – a former owner – or descendant of an owner who can confirm the Bobbs Merrill connection, or gives us any other information about the piece. It would be greatly appreciated! I can confirm the largest collection of Bobbs Merrill archives is indeed at the Lilly Library in Bloomington. I spent a good deal of time looking through them in search of information on Virginia Keep Clark. She illustrated a series of books published by Bobbs-Merrill and also did the “decorations” inside James Whitcomb Riley’s “An Old Sweetheart of Mine.” Based on what I found, it seems the author didn’t necessarily get approval over the artist who would illustrate their book. Perhaps someone at Riley’s level and connections, but I seem to recall Josephine Scribner Gates, an Ohio author who wrote the books Virginia Keep Clark illustrated did not. Just off the top of my head, fyi. I’ll also add: a friend I’ve not been in frequent contact the last couple years had a friend who supposedly was working on a book or Monograph about Bowen-Merrill and Bobbs-Merrill. If I find out anything further, I’ll make note! Thanks for your help! Any information is appreciated! As far as Riley and illustrators, I believe at least in Riley’s case he had some input – if not control over his illustrators. As an artist himself, I believe Riley had a distinct idea about what he wanted, and I know in the artists that I have researched – Riley had direct input. Riley’s first book by Bobbs Merrill, “Boss Girl,” had a cover illustration by author Booth Tarkington, which Riley approved. One of Riley’s next editions, “Armazindy, ” featured an illustration by Will Vawter whom Riley handpicked. Vawter was Riley’s favorite illustrator. As another Greenfield native, Riley saw Vawter grow up, and when Bobbs Merrill wanted an illustration for “Armazindy” – Riley immediately contacted the young 21 year old Vawter for the job. Vawter would go on to illustrate 18 of Riley’s editions – more than any other artist. As far as the Tiffany drawing – I do know that another one of my favorite illustrators was involved in this image. Ethel Franklin Betts was tapped by Bobbs Merrill to illustrate some of Riley’s Children’s books. In Betts illustration of the Orphant Annie book – there was correspondence between Riley and Betts with him giving her a description of what the real Orphant Annie (Orphant Allie – Mary Alice Smith) looked like. From the information I have found – Riley was extremely pleased with Betts’ depiction of “Annie” The Tiffany design is based on Bett ‘ s work for a Riley book as was mentioned in the article. And after seeing some of the completed Tiffany windows at the Morse Museum in Winter Park FL – this window would have been absolutely spectacular! Very glad to see you are back. I’ve missed the interesting notes on our city. Please keep it up. I keep waiting for something about an old tavern called the carousel. It had a rotating bar and peanut shells on the floor. I’ve never found anyone who knows it. Tim, Where was the Carousel? I met an older fellow who said there was a rotating bar on East Washington Street, but couldn’t find other neighborhood people who remembered it. I’m curious to learn more. I lived on the East side until I was 6 years old and my grandparents lived there after that. I remember my parents talking about “The Carousel” Bar when I was little and how it had a revolving floor. When I was little, I always told them that when I was old enough to go to a bar, I wanted to go there. It seemed fascinating to me. But, it was gone by the time I was old enough. It must have been operating in the 50’s, I think. I always thought it had been on East 10th Street somewhere, but maybe it was on East Washington street. Wish I could have seen it!